Today I want to talk about straddling in the kitchen. You know, working the line between flavors, textures and temperatures to your own advantage. Juxtaposing ingredients to ensure that every bite is both sassy and class. It’s similar to the way that a chocolate-covered pretzel or a good and salty margarita scratch some primordial itch that occasionally pops up and leaves you clawing the walls for the smallest taste of the intoxicating combination. And if you don’t scratch said itch, you feel a need to indiscriminately throat chop everyone around you, until someone plies your greedy mouth with a salted caramel cupcake. I totally approve – desperate times call for desperate throat chops, and I’d kill a man for salted caramel. Back to the transcendant chocolate olive oil – it can be difficult to track down, so feel free to use a top-notch, fruity olive oil in its place. The idea is sweet caprese salad more than true dessert. You can easily serve this as part of a splay of appetizers or as a dessert for a crew without sweet teeth. What up, sweet teeth? Preheat the oven to 400°. Line the slices of baguette up on a cookie sheet and brush with olive oil on both sides. Bake until golden and toasty, about 10-12 minutes. Remove from oven and let cool slightly. While the bread toasts up, dice the strawberries and add to a bowl. Stack and roll the basil leaves (like a drug dealer counting up your take) and very thinly slice the basil roll into paper-thin strips (it’s a muthafuckin’ chiffonade!) 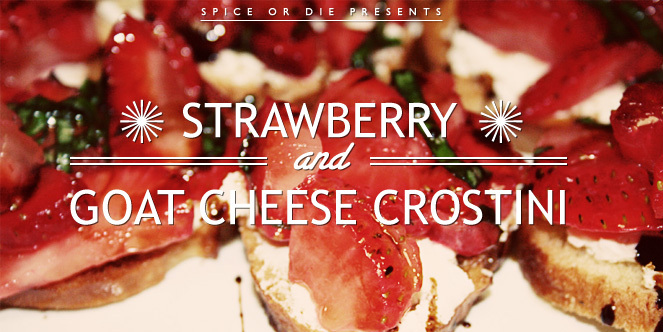 Toss the strawberries, basil and 4 tbs. of olive oil together and let them mingle for a little while. When the toasts have gone from muy caliente to warm, spread a little goat cheese on each toast. Top with a tablespoon or two of the strawberries and drizzle with a small amount of the balsamic reduction. Serve immediately. Oooooooooh, that pretzel sounds amazing! I recently became a fan of the super simple treat of melting dark chocolate on a slice of baguette and sprinkling the teensiest bit of sea salt on top. Far too simple to make for all of the danger that they get you into 😉 Oh my, indeed.